My husband and kids are huge pickle fans. They also love green beans. 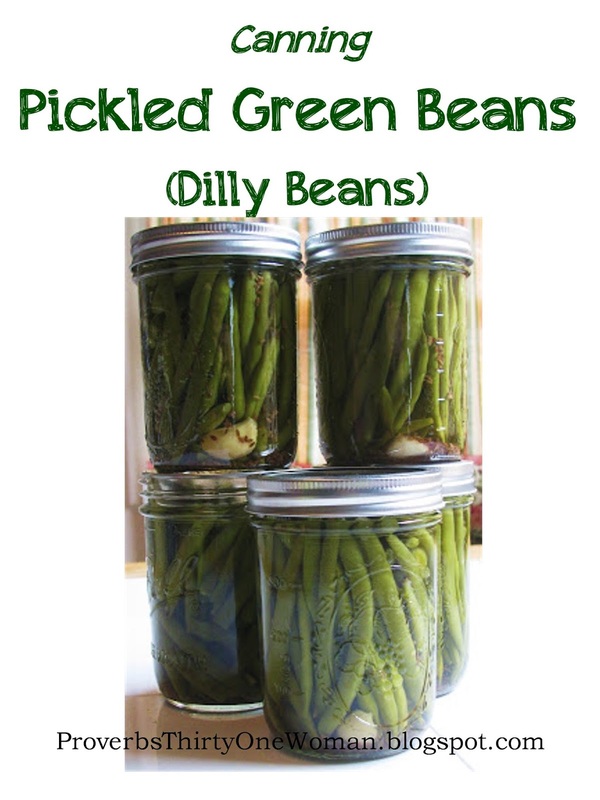 So pickled green beans (sometimes called dilled beans or dilly beans) are a natural in our home. 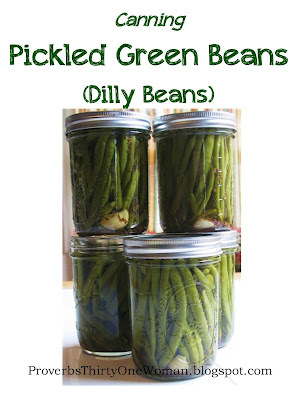 There are many, many different recipes for dilly beans, but I like this one best because it's so easy. 1. Review the guidelines for water bath canning. Prepare jars and lids. Fill a large bowl or sanitary sink with ice water. 2. Fill a large pot with water and place over medium high heat; bring to a boil. 3. Add the green beans to the pot and begin immediately timing 3 minutes. When 3 minutes have passed, remove the green beans and plunge immediately into ice water. 4. Pour any remaining water out of the large pot; wipe pot clean. Pour the vinegar and 2 1/2 cups water into the pot. Place over medium high heat; do not allow to boil. This liquid is your brine. 7. Pour the hot vinegar-water brine over the beans, maintaining a 1/4 in. headspace. Bubble. Wipe the rims of the jars with a damp cloth. 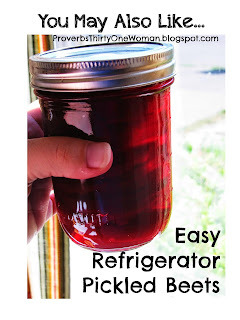 Add a lid and a screw band and place in the canner. 8. Repeat steps 5-7 until all the green beans are used up (or all the jars are filled). * NOTE: If you live at a high altitude, read this important information about adjusting canning times. 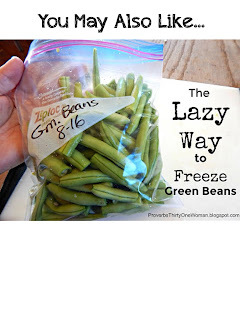 ** Only pickled green beans may be processed in a water bath canner. If they are not pickled, green beans must, for safety's sake, be processed in a pressure canner.